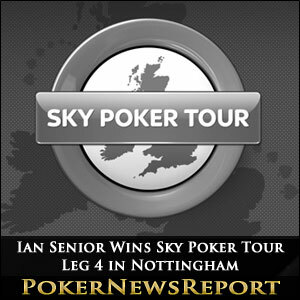 Ian “MacMonster” Senior took down Leg 4 of the Sky Poker Tour last night, in another sell-out event at the Dusk till Dawn poker club in Nottingham. 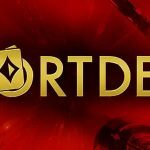 Leg 4 of the Sky Poker Tour was the highly anticipated two-day £40,000 guaranteed 6-Max tournament, and 246 players paid the £220.00 buy-in or qualified online to take part in the event. After 14 levels of action on Day 1, forty-three players remained: led by James Rann (504,000 chips) with Jamie Rhind (485,000 chips) and Matthew Dowler (438,000) his closest rivals. With only 33 of the 43 remaining players due to cash, one could have expected the start of Day 2 to be a little cautious. However, the money bubble burst within an hour of the cards being in the air when Stephen Jennison came second in a K-Q < A-K race to guaranteed the remaining players a min-cash of £400.00. The carnage continued once the money was reached as the short-stacks started shoving and, by the first break of the day the tournament field was reduced to just 20 players, with Jamie Rhind (800,000 chips) and James Rann (750,000) still heading the field ahead of Ryan Spittles and Gordon Casey leading the chasing pack. 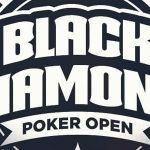 Ian Senior´s rise towards the top of the chip counts came with the eliminations of Tim Slater (16th) and Jonathan Helm (14th) and, when he rivered a flush to best Jamie Rhind´s paired Ace (5-5 > A-J), Ian Senior crossed the 1 million chip barrier and took the lead in the event for the first time. Ian Senior was not hanging about as the climax of the Sky Poker Tour Nottingham got under way. In the first big pot of the final, he converted pocket Deuces into a Full House to take a stack of chips from James Rann and, after Rann had recovered by crippling Tommy Dyer (who was bust in seventh), Senior flopped a set of Sixes to eliminate Ryan Spittles (A-K – flopped a pair of Aces) in sixth. Gordon Casey left the tournament in fifth, after running his A-5 into the A-Q of James Savastano, but thereafter it was all about Ian Senior. James Rann (Q-10 ) shoved his final 1.2 million chips from the small blind into Ian Senior´s K-J and watched the King pair on the flop to be eliminated in fourth before Senior (K-J again) flopped a straight to eliminate James Savastano in third and take a 5 million -v- 2 million chip advantage into the heads-up against Ross Bennett. 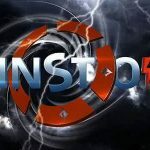 Bennett took a chance with A-4 in one of the first hands of the Heads-Up, but ran into Senior´s A-10 and, with a board of J-K-8 / 2 / J, Ian Senior became Sky Poker Tour 6-Max champion.